1. Are the watches 100% original? Yes, all Klepsoo watches are 100% original. All the glasses are shipped in their original hard or soft case depending on the model, and with cleaning cloth, box and included accessories. 2. Do the watches come with a guarantee? Yes, all our watches have a guarantee that covers all production defects but not damages due to ordinary use of the item. The warranty lasts 24 months and you may require assistance to any authorized dealer. You may be require to send us some pictures that show the defect to big@klepsoo.com in order to judge if the defect is under guarantee. Any spare parts that are not under guarantee can be sent with fee. 3. Are the watches shipped in their original case? All watches are shipped in their original case with their accessories depending on the model. 4. Are the watches immediately available? Many watches are immediately available in stock. You can contact our customer service to check availability of the items that are not in stock. 5. Are the watches brand new? Yes, all Klepsoo watches are brand new and 100% genuine. All the watches are shipped in their original case with their accessories depending on the model. 6. Is it possible to order spare parts? Yes it is possible, please contact our customer service to know the prices and the availability. 7. Why are your prices so low? Klepsoo can keep low prices as we order huge quantities from our supplier. Moreover, online sale permits to eliminate intermediate steps and further manufacturer costs. 8. Does the measure of the case correspond to the measure of the dial? 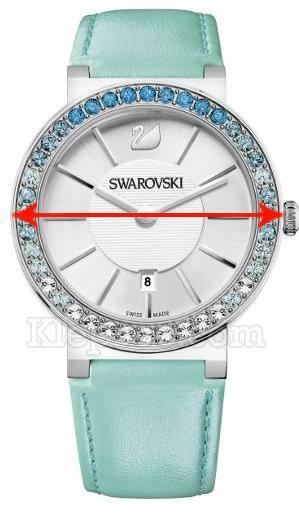 The case includes the dial and the metal or plastic rim around the dial, till the hinge of the watch strap. 9. How you can measure the size of the case? If you have a round case watch, you measure the case horizontally, from one extremity to the other, considering the two metal/plastic/rubber rim till the crown. The manufacturers often indicate two measures if the watch is square or rectangular: horizontally till the crown and vertically till the strap. 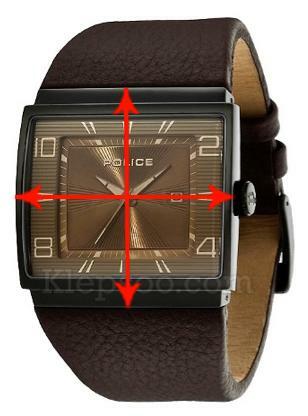 In case of a square or rectangular watch, you will see only one measure, the horizontal one. 10. What is the difference between boutique and outlet? In both categories watches are guaranteed 100% genuine and brand new. 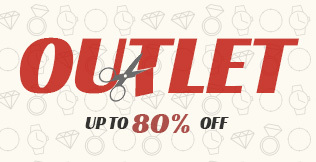 In outlet category, you can find old collections watches with discounts up to 80% and new collections models that are waiting for an updateing specifications. In boutique category, there are latest collections: for each watch you can find very detailed specifications. 11. May discounts and prices change? Yes, discounts change frequently according to the availabilities and to our suppliers' offers. We offer discounts based on our official manufacturers' prices and these may change depending on the manufacturers' decisions. We accept payments through credit card or Paypal. We accept Visa, Mastercard and Amex (only for payments in Euro and USD) directly or Discover and other cards by choosing Paypal (it is not necessary to have a Paypal account to access). 3. Can I pay with Discover? Yes, it is possible choosing Paypal (it is not necessary to have a Paypal account to access). 4. Is it safe to pay with credit cards? Payments with credit card are 100% safe. Credit Card data in transit are transmitted only via the Banca Sella server (protected by the SSL3 security protocol with high-grade 128 bit encryption: the highest safety standard currently available using server-side certification) and subsequently to the international authorization circuits. 5. What should I do if I cannot pay with my credit card? If there are not problems related to the credit card itself, please try again to place the order changing browser, delete the chronology and if necessary choosing Paypal as method of payment. 6. What should I do if I do not receive any confirmation after completing the order? Please contact our customer service. immediately if you do not receive the order confirmation. 7. When will I be charged? If you pay with credit card, we charge once the order is ready. In case shipment is delayed, payment will be charged after 24 days from your payment authorization. While if you use paypal the payment is collected instanctly. 1. How many days does it take to get the watches? If the watches are available in our stock, we will notify you the shipment of the package in one business day. If the watches are not available in our stock, you will receive an email with the estimated waiting time of the watches. After that, handling times depend on the courier and on the customs in your Country. You will be able to track shipment on the courier’s website by entering the tracking number provided by Klepsoo. Shipments are carried out by couriers (Fedex, UPS, TNT), it is not possible to ship by regular mail (postal service). Freight charge already includes the priority service for each shipment. Items are accurately packed to avoid any damages during transportation. If any problem occurs, do not hesitate to contact the courier and Klepsoo. 3. How much are shipping fees? Click here to check the freight charge. 4. Is is possible to ship as gift or declare a lower value in the invoice? Every package is shipped with its invoice in case of custom inspections. It is therefore not possible to declare a lower value on invoice or ship as "gift" or "sample". 5. How much are the shipping fees if I buy more than one item? Klepsoo offers you a special deal: if you order more than one item up to 5 pieces you will pay only one freight. 6. Are there additional taxes for shipments to Europe? For citizens who live in the European Union, the prices include VAT taxes. 7. Are there additional taxes for shipments to Extra–EU countries? For all the customers that live outside the European Union, taxes are not included in the price. For this reason you may be asked to pay the corresponding duties when the items reach your country. Duties depend on the customs of your country and not on Klepsoo, in addiiton they are on the recipient's account. Klepsoo cannot control or predict these charges and their amount, as Custom policies vary widely from one country to the other. If you need further information about Custom fees please contact your local Fedex, UPS, TNT or the Customs directly. Duties are usually collected by the courier upon delivery but they may also be applied later. 8. How much are the import taxes? Import taxes are not applied by Klepsoo but on your Customs. Each country follows its own policies and we do not know how much the duties are. In order to have information about the amount of taxes, please contact your local Fedex, TNT or UPS or the Customs directly. 9. Is it possible to change the country of delivery? Yes, you can choose the country of delivery from the dropdown menu. Our system will automatically update the shipping costs and the price of the item (which is subject to VAT for countries that belong to the European Union). If you are facing any problems by changing country, you may proceed your order just writing in the notes the correct country of delivery, then an operator will update your the order, adapting the shipping costs and the price of the items accordingly. Please note that the nation of billing and shipping must be the same. 10. What should I do if I cannot track the package? The tracking number is activated in 24/48 hours time from the moment you are notified. Tracking numbers sent on Fridays will be active on the following Monday. Couriers may not deliver on Saturdays, Sundays and on bank holidays depending on each country. 11. I sit possible to ship to po box? Klepsoo cannot ship to PO BOX, as the courier will require a signature for the delivery. 12. Is it possible to ship to an APO address? It is necessary to indicate a physical address of the base in the foreign country. 13. Is it possible to ship to a Packstation? Yes, Klepsoo can ship to a Packstation. Dhl will forward you a sms with the unlock code that you need to pick up your package. You have to collect your package within 5 days from the notification. 14. Is it possible to deliver without the request of a signature? The courier needs a signature to deliver the package and it is not possible to leave it unguarded. Only in USA, the recipient can contact Fedex customer service and authorize the delivery without any signature. In this case Fedex and Otticanet will not be responsible for any steal nor damage. 15. Is it possible to gift wrapping the package? Klepsoo cannot wrap your package, all our items will be shipped in their original and elegant case with any accessory provided by the supplier. 1. Is it possible to return the watch I received? First of all, you have to complete our return form, then wait for our e-mail with all the instructions. The product must be unused, clean and not damaged. Moreover, the items must be returned in their original packaging with case and all the accessories you received. 2. Do you charge a restocking fee on returns? Yes, we charge 10% restocking fee on all returned items. 3. Who is going to pay for the return shipping fees? All the shipping fees are at customers' charge. 4. Can I return the item for an exchange? Yes, if our return conditions are fulfilled, you may choose to exchange the item. Please consider that we will charge a 10% restocking fee and all the shipping fees are at your charge. If the price of the new item is lower, we will refund you the difference. If the price of the new item is higher, we will ask you to pay for the difference.